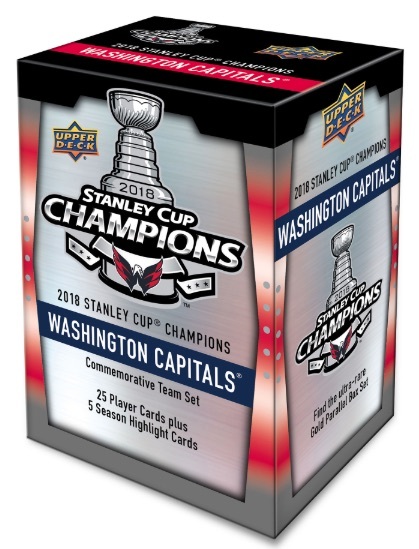 It took over four decades but the Capitals are finally NHL champs, a fact officially recognized on cardboard with the 2018 Upper Deck Washington Capitals Stanley Cup Champions set. Each box contains the main 30-card checklist. The licensed Capitals Stanley Cup Champions boxes can be purchased for $29.99 at Fanatics. The commemorative team set is very simple with a small base offering and a few parallels. 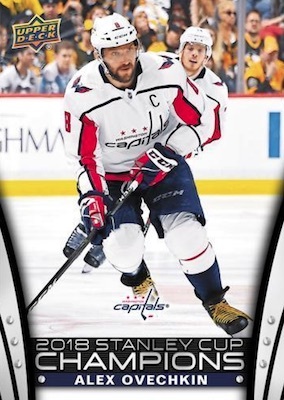 Led by Alexander Ovechkin, each 2018 Upper Deck Washington Capitals Stanley Cup Champions box contains 25 player cards and five "memorable moments" cards from the regular season. However, there is some rarity to be found, including Base Short Prints, Team Color parallels, numbered to 2,018 sets, and Silver parallels, which have just 18 copies. Of course, these UD factory sets are just one of many Washington Capitals Stanley Cup Champions items available to fans. Also, there is a special card set for the team that the Capitals beat for the Cup. Making great strides in their debut season, the 2017-18 Upper Deck Vegas Golden Knights Inaugural Season set honors the expansion team's quick success. Order 2018 UD Capitals Stanley Cup Champions boxes at Fanatics. 30 cards. Buy 2018 UD Capitals Stanley Cup Champions boxes from Fanatics. PARALLEL CARDS: Team Color #/2,018, Silver #/18. Any checklist on this set yet? I ordered one and ended up with a Lars Eller SP added in. Just curious what other players have SP cards. Nothing yet. It will be posted as soon as we have it.